While the Stock Market Sells Off? How to Choose Which ETFs to Trade: Simple step-by-step scanning directions show you how to choose the best short ETFs to trade each week (these strategies work on any charting software platform). Discover what specific changes to make in your personal trading approach that are essential for potentially trading short ETFs more successfully. All-new “Best Practices” in Short ETF trades based on Ken’s real trade experiences over years of trading in and out of short ETF positions… an “instant shortcut” that will teach you the specific “mechanics” of what to watch out for to help you spot the best potential trading setups that are worth trading. PLUS — Advanced Short ETF Trading success strategies, including “Pair Trading” (such as FAZ/FAS), “Premarket Trade Setups” for short ETFs, “Trading Short ETF Gap Plays”, “Big Money” trades (how to start scaling in on larger size, where to determine entries and stops, and more). Now’s a perfect time to acquire the knowledge (from me, a real trader), you can use to help trade the short ETFs for yourself. With our broad markets having recently experiencing one of the biggest rallies ever, it’s a great time to learn how to trade the inverse, or “short” exchange traded funds (ETFs). Why? Because if and when the market collapses again, like it did earlier, you need to be prepared to potentially profit from the market meltdown. Discovering how to trade the most-popular “Short ETFs” in the world, like FAZ, QID, VXXB and others can be your single biggest trading opportunity for making winning trades when the market sells off (again!). Many traders don’t like to short stocks. I personally don’t like to hold short positions overnight. I’d much rather hold long positions in the short ETFs, because they go up during market downtrends. And the best part is, unlike futures or forex, they don’t require a separate special type of account, or understanding of how to buy or sell them… because they trade exactly like normal stocks do. These little-known Wall Street “hedge” instruments are among the most widely traded instruments in the world, with millions of shares traded a day. So they’re easy to trade in and out of, because of the very high volume they trade with. But if you don’t know what you’re doing, you could easily take losses due to their volatility. This is especially true for the triple “leveraged” ETFs (like FAZ and others, which move 3x faster than regular ETFs). Knowing the nuances of how to skillfully trade these powerful ETFs the right way can make a big potential difference in your personal trading success (or lack thereof). As someone who correctly bought these during the infamous “flash crash” (see proof at my tradingtalk.com forum thread on real trades w/brokerage screencaps), I’ve had years of hands-on experience trading these short ETFs. And as one of the trading industry’s best-known momentum day and swing traders, I’ve got the credibility and expertise that’s worth learning from. I’m the “go to” guy for breakout momentum active trades, and with all the practical real-life trading experience I have in trading the short ETFs, I will show you exactly how to trade them for yourself, with specific “mechanics” of the trades, explained. The “professional trading workstation advantage” in my videos: Just as if you were sitting here next to me, I use actual pro charts that you learn from in the videos as I reveal exactly how to trade the short ETFs, explained step by step so you’ll learn fast. If you’ve seen any of my videos or webinars, you’ll know that unlike the powerpoint theory-bs that vendors use, I teach you using my actual trading workstation, so you can see the same exact charts I use in my own actual trades, “deconstructed” for you to learn from, in just minutes. Ready To Learn How a REAL Trader Enters and Exits Short ETF Trades… PLUS how YOU can quickly use these advanced day and swing trading strategies in your own trades, too? for Short ETF Trades Ahead of Time, BEFORE You Enter ? Quickly being able to spot which short ETFs are the best ones to trade, with the help of the specific guidelines you’ll learn, can potentially make a big difference in your ability to stay clear of bad trades, while focusing on those with the best trading odds for getting into each new trade. How to “focus in” on what to do before each market day opens, using the premarket gap patterns in the short ETFs to help you develop a specific trading plan for each day’s trading ahead. Every trading day starts with a quick look at specific gap patterns in the short ETFs, to determine market bias before the opening bell. You’ll discover a step by step process that I’ll reveal, that shows you exactly what’s important to pay attention to (and what to safely ignore), so you’ll be able to know what to do when trading each day. For swing traders, you’ll also see the short ETF swingtraders’ entry and exit patterns I use myself for my own trades, to help you understand exactly how to spot these trading setups for yourself. How to start using short ETFs as a regular part of your trading routine. New to trading short ETFs? Not to worry, as I’ll walk you through the most important steps you need to trade these. For experienced traders, you’ll learn advanced “pair” short ETF trading setups for combining FAZ/FAS, QQQ/QID, ERY/ERX and other paired short ETFs as part of your daily intraday and/or swing trading process. The key is to have a well thought-out specific process to use whenever you trade the short ETFs — and that’s exactly what “Trading Short ETFs” will deliver. The specifics, the “mechanics” behind powerful trading entry and exit skills, and how to do this for yourself before every trade you make. How to trade multiple timeframes, using candlesticks, western cup breakouts, market internals and more. By knowing a complete, focused set of actionable strategies, you’ll be able to quickly put together a trading approach based on what I’ll show you, that you can start using yourself in just minutes. One key to professional trading success is your ability to quickly combine several key signals along with your “soon to be learned” Short ETF trading skills. In this carefully designed approach, you’ll be “taken by the hand” during the videos and shown how to trade the short ETFs step by step, as you “look over my shoulder” and discover everything you need to know. You’ll see how to trade short ETFs on your own, once you register your spot right now, and learn how it’s really done. With upcoming potential selloff days (and even weeks) coming in the markets, it’s vitally important for you to learn “Trading Short ETFs” for yourself. Click here to enroll today, one easy payment of just $247, which includes all SEVEN hours of high-resolution video downloads for you to keep. You’ll Get complete access to Trading Short ETFs for a single low $247 registration! This is an outstanding coaching value for active traders, because you’ll get a full 7+ hours total of active trader videos to download and keep, produced by a top trading industry pro, to help you see exactly how to trade short/inverse ETFs for both day and swing trades (plus trade management tactics and more), based on real swing and intraday trading experience. You get a complete 7+ hour course that will show you step by step EXACTLY how to trade the ‘bear ETFs’ when the market sells off. A “must have” for smart active traders! 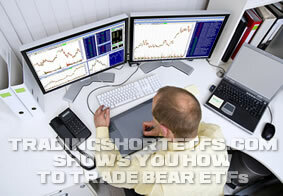 Place Your Order for Ken’s “Trading Short ETFs” Training Right Now. I’ll See You Online… Let’s Trade!